Traveling abroad is awesome, don't you think? Seeing new places, meeting new people, learning about a nation's customs – there's nothing quite like it! There's one not-so-minor problem, however. Few of us have the time and/or resources to embark on a journey to a foreign country. Thankfully, there's quite a lot that out mobile gadgets can do. They can't teleport us across the ocean, of course, but they can take us on a trip across the world, albeit a virtual one. We give you 10 apps made for the purpose – 10 apps that let you explore distant lands right from the comfort of your couch. Check them out in the slideshow below! Trover's goal is to deliver "The best of everywhere" with its mobile app, designed for on-the-go discovery. Use it to explore beautiful places from all over the world, photographed by the passionate Throver community. You're free to check out what's worth seeing nearby, or to browse images taken at a place of interest on the other side of the planet. Triposo is built to serve as a travel guide to the world. You just pick a country or a major city and a detailed, illustrated guide will be downloaded straight to your device, with places worth seeing pin-pointed on a map. In addition, Triposo provides information on a nation's festivities, culture, staple dishes, and more. One of the app's advantages is that it works offline – useful for travelers with no internet access when abroad. Browsing photos of distant locations is one thing, and reading a story about them is another. Finder is made for the latter – members of the community leave notes around the world, telling stories about the places they've found on their journeys. Notes are accompanied by images and can be seen by anyone when set to public. Here's one dedicated to the beauty of wildlife. With Explore.org's mobie app, you can enjoy live streams of wild animals, including bears, puffins, monkeys, and pandas. Also, the app features dozens of galleries of wildlife photos and educational movies about nature. History Here is an interactive guide to thousands of historic locations across the United States, featuring photos, videos, and dynamic maps that bring history back to life. Explore the famous and not-so-famous spots hidden all around, including amazing architecture, museums, battlefields, monuments, famous homes and much more. Google Earth is one of those must-try applications. It lets you fly around the planet with a swipe of a finger and explore pretty much every mile of it. Street View comes built-in for those times when you feel like going for a virtual walk across the Red Square in Moscow or the Gangnam District in Korea. Select cities, including San Francisco, Boston, Rome, and others, are recreated in 3D for a stunning "flyover" view. This app will bring the beauty of the 58 National Parks across the USA straight to your iPhone or iPad. From Acadia and Yosemite to Yellowstone and the Grand Canyon, all locations are illustrated with literally thousands of professional photos for your viewing pleasure. Ordinary folks can't just hop on a spaceship and see the world from outer space, or at least not yet. We can, however, enjoy the thousands of stunning images that Nasa is kindly sharing with all of us. What's more, you can learn more about distant galaxies and space objects, or just check out what missions the agency is currently involved with. 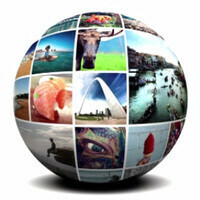 SphereShare is a service that allows people to easily post their photo spheres online. Others can then see them on their Android device or computer's web browser. Over 25 000 photo spheres from all over the world await to be explored. And last but not least, we have a game for you. EarthGuesser picks a random location on Google Street View, and your job is to guess the location. The closer you get to the answer, the more points you'll make. The app is pretty new and as such it isn't perfect, but it is fun to try nonetheless. 6, 8 and 10 are interesting! Many people could take a vacation to a different place in the world each year if they gave up their mobile phone plans.